Cycles of loss can be very beautiful. Secrets are revealed. Details previously obscured suddenly show us a fresh view of something we thought we knew well. 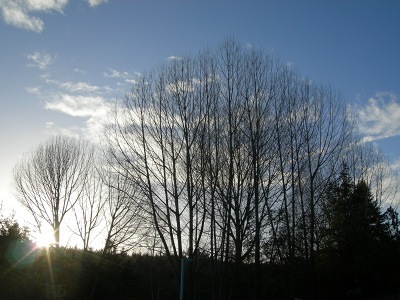 These trees down the road from my house boast a level of magnificent intricacy I couldn’t have seen a few months ago. Winter, and what it takes with it, can be enlightening. And it can be harsh and painful. And inexplicable and unfair. As solstice began last week, one of my very close friends died. Dan Morris couldn’t have been more than 40, and those four decades had spent themselves creating a brilliant person with immense talent and a huge heart. If only they had created better kidneys for him, while they were at it. A phenomenal musician with an otherworldly sensitivity, he was not only a percussionist and a composer, but a visual artist. His love for birds, action figures, his wife Marie, and sushi knew few bounds. And he was the most generous, wry witted friend one could ever hope for. We take the artifacts of our daily lives for granted and sometimes barely notice the items that fill our spaces over time. As Dan lay in a coma 1200 miles south of me, my eyes kept stubbing themselves on small things that have lived in my studio over the years. The teal ceramic Turkish dumbek he gave me and taught me so patiently to play. The pastel he drew of one of his seven parrots. His Tranzport remote that allows me to record live in another room while single-handing my sequencer. The myriad of tiny action figure muses he gifted me with to inspire fearless creativity. The stack of Fripp and Eno CDs we both loved that I kept meaning to return to him. The magnificent intricacy of my friend was constantly unfolding, season after season. In his permanent absence, I’ll continue to see and to discover. And to smile. I’m convinced that a person’s legacy is in the memories he leaves with the survivors who loved him. One of Dan’s last, amazing recordings graces my new CD. You can hear a small excerpt of him joyously playing a slew of different drums from around the world on the first track, Slipping, above. I know that he would be far more pleased to have his remembrance on my little blog accompanied by this silly piece than with some serious elegy. Winter, and what it takes with it. The cycle of loss is unavoidable. It’s up to me to find the beauty in it, somewhere. Isn’t this what everyone finds in their bathtub? With some sunlight streaming in through the adjacent picture window, the downstairs tub is a fine place to take cover when too many people are traipsing in and out of the house and the humans who claim to own you (ha! what a joke) want to shield you from the chaos. Truth be told, these cats never need shielding; they love people no matter what sort of large power tools they might be using. That puts them one step ahead in the evolutionary chain from their mother, the sonically intolerant composer. But since Smudge and Moses could either be lunch or at least part of the weightlifting program for a bald eagle or owl, when the front door needs to be kept open this is one of several safe refuges around. If I had a photo, and yes, I promise sometime I will, I would have posted an even more entertaining pic of Moses (dressed in black) at my feet, underneath the upstairs shower. As in, IN the shower. With me. Yes, while the water is pouring down. Loving it (hey, who wouldn’t? Oh, wait, this isn’t that sort of blog…). Moses always tries to be as close to the water when I’m bathing as possible. In past houses this usually required sitting on the edge of the tub and craning his neck until the spray rained down on his clueless head. But here he’s found Nirvana: an over-sized walk-in, stretch your legs kinda shower that has plenty of room for a litter of seafaring cats. Of course, the only one I know is Moses. I will try to remember to bring my camera upstairs with me. Stop giggling and don’t get your hopes up: you’ll see ALL of Moses, and… glean an idea of my shoe size. 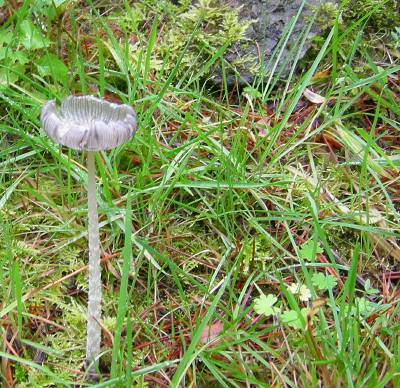 If I had the time (because I do have the interest), I could spend hours cataloging the many unique mushrooms I come across on the modest acreage of which I have the honor of stewardship. Each is a piece of public art, erected very suddenly while no one was looking. And just as quickly, little museum thieves whisk them away. I walk across the same piece of property every day and, like the ocean, it is never the same two afternoons in a row. Lots of these fungal flowers, if not mingling in little coffee klatches of a handful, are loners, standing upright with an admirable defiance and too-brief beauty. This one, reaching five inches toward the sky, would be picked for the mushroom basketball Olympics if they had one (and maybe they do… who knows what goes on in mushroom-land when we’re not paying attention). The tinge of purple and the delicate upturn of petals is not what I usually see with the rest of the fun guys who wear big hats. I’ve been a bit of a mushroom myself this week, holing up like a hermit and preferring the dark (easy to do here since the sun sets at 4:15, shortly after I’ve finished my morning coffee). I managed to bribe my muses with enough red wine and dark chocolate over the past few weeks and they have finally returned to play with me. This is a good thing, since I have two commissions that could not be more different from each other in every conceivable way– style, instrumentation, client– due almost at the same time. And that time is coming up shortly. Be kind to your muses and they will be kind to you. And talk to your mushrooms, and sometimes they will talk back. Maybe even sing. Inspiration comes from everywhere. I steal it like a mushroom thief. I am easily goaded, and a New Faithful Kelpisto, writer Glenn Buttkus, asked for some of my poetry to round out the musings, music, and images here at Algae Central. I have no other poem to offer but this one; my sole foray toward concise expression. Those who know me will tell you I am many things and concise is not one of them. The photo was snapped on Thanksgiving Day. Appropriate, I think. Well, I’m not concise, but at least I’m not… dull. Today the islands are having their first glimpse this season of white powder. I woke up like a little girl, announcing excitedly to Charles, “it’s snowing! it’s snowing!” and watched as everything became dusted and magical. I went outside in my flip flops and pajamas to feed the birds and reveled in the flakes brushing my skin. For a northern-born soul like me, it was exhilarating. We’ve had just a sprinkle of flurries so far on San Juan, but parts of neighboring Orcas Island are already laden under an inch or two. 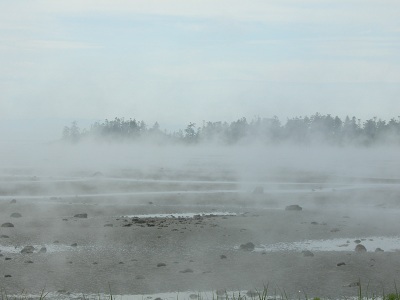 Hot Mud, for a hot flame. Now, THIS is my kind of fire! Here is my sphinx, praying to the Great God of Benevolent Fire. The driveway and what had been the front of the home I lived in for five years until 2002, and its garage, now a gaping abyss. I look at the firefighter with only a garden hose, and recall the hundreds of times I stood on that exact spot, watering my plants with that same hose. Two more photos to accompany my previous entry, because they are compelling and meaningful to me. And possibly to my many friends who walked across the threshold and down the three levels into this special house between 1997 and 2002. This is the kind of personal narcissism that leads so many blogs astray, and I promise to return us to our upright and locked, sunny, wildlife-filled position after tonight. But a highly unusual event like this one is worth a few more sentences, especially given the touching comments and emails I’ve received. Thank you all. 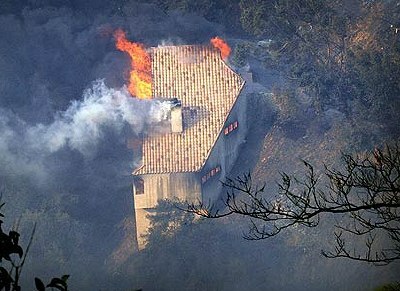 My heart goes out to the owners of the house. Above you see my former landlord standing dazed amidst the flattened, defeated rubble, in a photo that was the huge front page lead for this morning’s L.A. Times. And I feel terrible for the renter who had just moved in a mere two weeks ago and lost all of her belongings. That could have been me, and it was so many others this weekend. 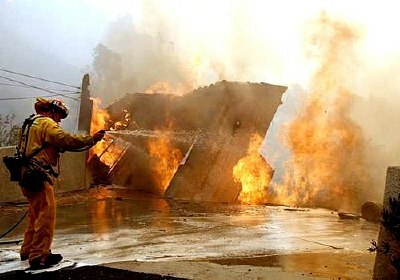 Close to 60 homes were destroyed in the firestorm and many, many badly damaged. The numbers represent an enormous percentage of a small neighborhood set among state parkland that was idyllic and will be again, with time and patience. 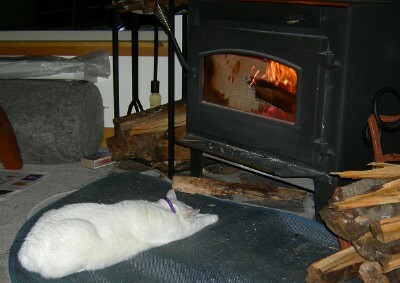 The weather is brisk here on San Juan Island, and our wood stove is a primary heat source. It’s an uncomfortable sensation to peer into these photos of fire ravaging my past and someone else’s present, and then rise from my chair to purposely stoke the neatly contained blaze in the living room. Back to the earth, up to the sky, and onward to the future. Throughout my life so far, I’ve probably changed addresses slightly less than many adults. For 18 years I lived in the same very tall building in Manhattan, followed by three more in another shorter one across town. At 21 when I headed to the Great West to seek my joy, I didn’t know that I would spend the next 24 years in Los Angeles and its environs. Fully 20 of those were split between just three addresses: 10 years in the same place in Van Nuys, and the next 14 in Malibu. After renting a couple of places there short term, I lived in two that were very significant and dear to me, for 5 years each. 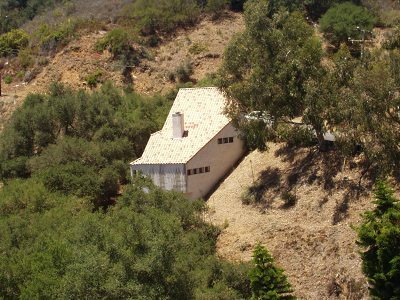 One of those very significant places, pictured above from my time there, burned to the ground today in Malibu’s terrible Corral Canyon fire. 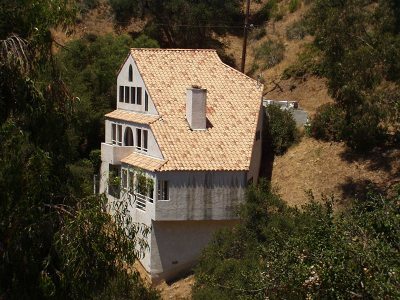 The oddly shaped stucco and tile architecture clung to a steep, oak and eucalyptus laden hillside. With no immediate neighbors it offered me tremendous peace, and abutted one of the best hiking trails in the area. But what became most special about this place to me was that it represented enormously key personal and professional turning points in my life, each of which altered its direction for the better. The amount of drama I experienced at this address– very good and starkly otherwise– is indelible many years later. 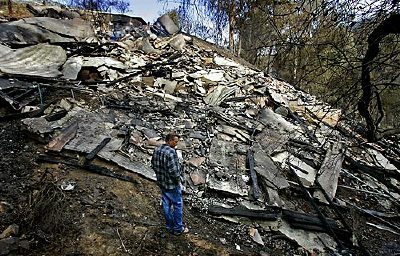 So indelible, in fact, that when I came across this sad photo on the L.A. Times website of my beloved former residence melting into the earth, I was flooded with details and memories of every room and all twenty seasons of my life that they sheltered. I have written in these blog pages before about impermanence, and it is a constant truth. But despite my own imminent melting back to the earth someday, as long as I’m here and of sound mind, my memories remain. They are all that I truly possess. Elegy for five years of memories. You were expecting a turkey? 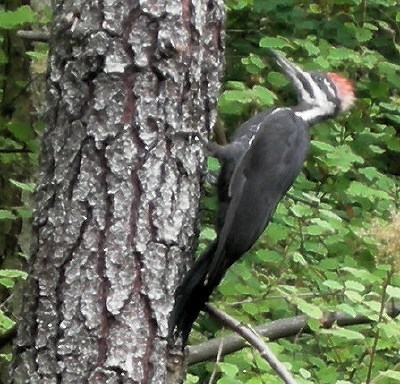 Meet Petey, one of the Pileated woodpeckers who comes ’round to bang away on our trees. We do have wild turkeys on the island, but since none has waddled onto my property yet, you get served woodpecker instead. Well, virtually. I’m a vegetarian, and I doubt this guy tastes that good anyway. A happy holiday to all my e-friends! Two sounds weigh in against each other. Balance is often a good thing. English is a weird language because while it’s easy to get off balance, one never gets on it. This week I continued honing my circus skills and juggled several things at once: ongoing bang bang buzz whack bang whrrrrr smack house remodeling bang oops slam ahhh, ongoing note remodeling in the form of a concert wind band piece I’m in the flurry of composing, and ongoing thought remodeling in the form of a new essay, which was published in the webzine NewMusicBox on Wednesday. I will admit that the presence of the bang bang whack bang whrrrrr was not especially conducive to the powers of concentration needed for the other two tasks occurring a few feet away, but having no choice I learned to stop my internal whining (which at times may have been louder than the table saw) and do my best to tune it all out. As it happens, the tune in my head is not in the same key as either the table saw or the air compressor, making this an even more, uh… interesting, exercise. More often than not, the day’s interruptions, both home and business related, necessitate working during the only pocket of blessed peace and quiet: from after dinner until 5 or 6am. These have been my normal working hours for many years. Except that in the past, I’d sleep until about 11, sometimes noon, and after 5 or 6 deep, zzzzz-filled hours I’d be refreshed and ready to start all over again. But with workmen showing up at 8:30am, well now, it throws a vampire’s body clock waaaaay off… balance. And so the cycle begins anew: bang bang, work work, try try, finally finally, no sleep, no sleep, good morning Bob/Michael/Howard/Jessie/whoever you are in myblurryeyes, would you like a cup of coffee?? Ah, the weekend has arrived! For two days, coffee will wait until…. noon! 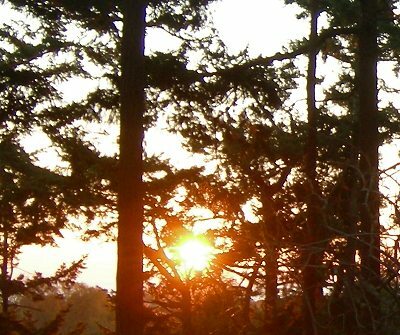 From time to time the Pacific Northwest is hit with major wind storms, and we just had a good one. The 61 MPH winds that hit Friday Harbor are nothing compared to the 92 MPH ones that visited Seattle. Power is still out in some places, inviting those without generators to step back from their computers and enjoy the nearly forgotten rituals of reading and conversation. And many other activities that don’t require power. Use your imagination. That doesn’t need electricity, either. It was a dramatic night. Despite the chill and roar of the dry gales, we slept, as always, with the window open a few inches, taking in as much of the charged air as our lungs could hold. Small tree limbs were tossed against our roof and unrecognizable sounds implying varying degrees of chaos filtered through our dream states. As the almost rainless storm died down the next day, Charles and I assessed the results to our property (not bad, all things considered), and then couldn’t resist maneuvering our truck around fallen trees and debris to get to the most weather beaten part of the island, the west side. 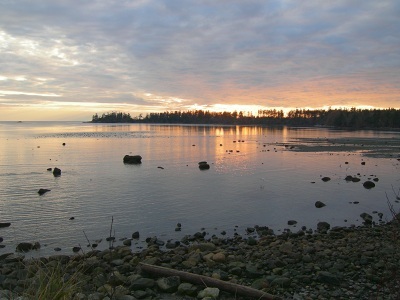 Once there, we basked in the sight of the unusually large waves between us and Vancouver Island. 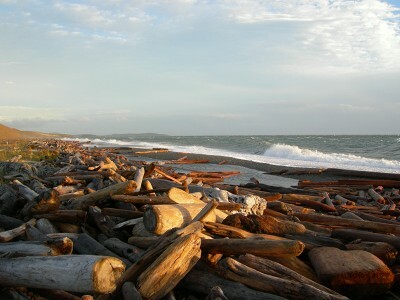 The beach around American Camp on the southwest end of San Juan Island is, like most shorelines here, draped in miles of forgotten timber and driftwood. This visit was an object lesson in just how all those pieces got there. 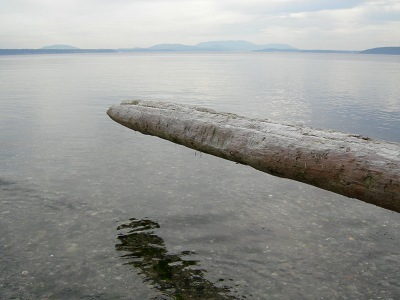 There’s nothing like watching a 30-foot long log haplessly surf the waves and then be deposited hard on the sand like an abandoned kayak. One by one, these castaways keep the outer edge of paradise in a state of constant change, and me in a constant state of awe. An intermezzzzzzo for this intermezzzzzzo. 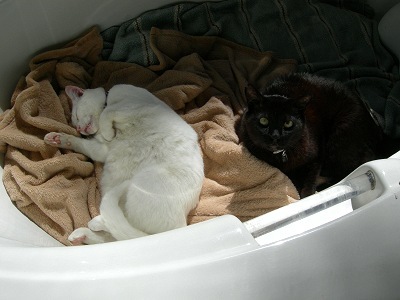 No, I did not put them in this pose (anyone who is owned by cats knows how impossible such a task would be). 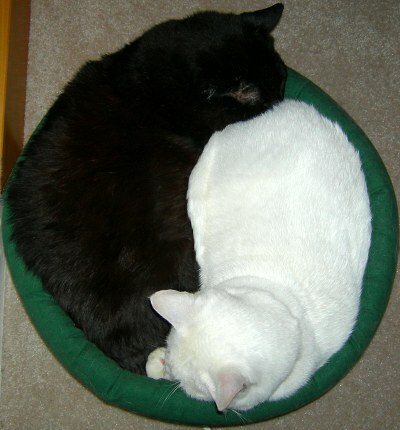 In fact, as my essay readers know if they’ve scrolled down that menu page, my boys Moses and Smudge are quite fond of this position and can often be found as they were last night, happily entwined in one of their two heated cat beds. That this occurs regularly never dampens my enthusiasm to snap more photos; it’s too darn cute and I just can’t help myself. I’m hopeless, I know.